Mohandas Karamchand Gandhi was born on the 2nd October 1869. 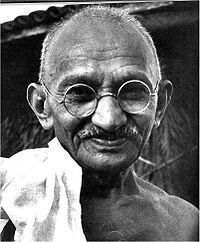 Gandhi was born and raised in a Hindu Bania community in coastal Gujarat. His father was a senior government offical. He tainded law in London and became famous for fighting for the civil rights of Muslim and Hindu Indians in South Africa. Gandhi fought for civil rights and was appalled by the treatment of Indian immigrants in South Africa so he joined the struggle to obtain basic rights for them. He strongly believed in piece, freedom and fairness and fought for years for peoples rights, he was sent to prison in South Africa many times. He fought for so many years so that people could live a happy free life. Gandhi's main protest was his massive non-violent protest march to the sea to protest against the salt tax which was affecting everyone in India at the time. He embarked on the massive 240 mile journey on the March 12th 1930 with 78 male satyagrahis (activists of truth and resolution) started their 23-day-long journey. Other non violent protests consisted of speeches and smaller scale protests. I believe that Gandhi's methods were successful as he was able to gain independence of India from the English although this caused conflict in Pakistan. I think that his methods of peaceful protest did well as they didn't cause physical battles and mostly achieved what he wanted. If I was to do everything he did i probably would have involved women in the sea march so that no one thought i was being sexist.